Under an increasingly variable and arid climate, household food security in rural Zimbabwe depends upon womens success in growing vegetables in community gardens. 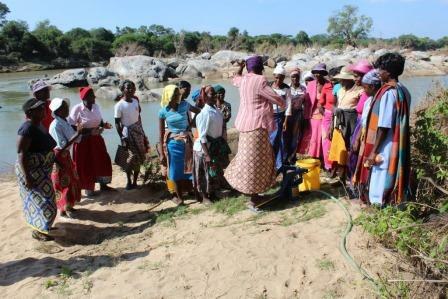 To irrigate, women do the laborious and inefficient task of carrying buckets of water from a nearby river and flood-irrigating vegetable beds. The Muonde Trust is a community-based organization dedicated to the development of educational, agricultural, and community programs in a group of villages in south-central Zimbabwe. In collaboration with Muonde, we initiated a project aimed to increase food production and income. Based on field surveys and utilizing a modest amount of crowdfunded resources, we designed irrigation systems for the womens community gardens. The project was implemented in April 2017, and included rigorous training sessions for and by local women. After the first growing season, preliminary results indicate that the irrigation project and associated community development work led to a decrease in the effort and time spent on irrigation, that elder women are returning to the gardens, and that the sense of food security has increased. The project is becoming well known across the region, and agriculture extension officers are advocating this as a flagship project amongst other communities. In the talk, Dr Raz-Yaseef will discuss observed shifts in gender dynamics. Dr. Raz Yaseef is an Ecohydrologist expertizing in understanding water resources as an intersecting point between management, land-use change, climate change, natural environments, and hydrology. Over the past 15 years, she studied the controls of management and climate on water resources in managed and natural environments. Her research topics included: estimating crop rotation efficiency in the U.S. Southern Great Plains in light of increasing summer heat and drought conditions, defining the vulnerability of oak-grass Californian savanna ecosystems to changes in precipitation patterns, evaluating the sustainability of agroforestry in semi-arid deserts of Israel, and modeling spatial patterns of evapotranspiration under changing permafrost conditions in the Alaskan Arctic. In addition to scientific research, she initiated Pump it Up, a project that brings irrigation pumps and drip systems to women community gardens in Mazvihwa, Zimbabwe. In Zimbabwe, she also installed weather stations and trained agricultural extension officers and farmers how to collect, analyze, and utilize weather data as a tool to enhance agriculture production. In addition, she consults smallholder farmers on topics such as water harvesting, water saving, and sustainable agricultural practices.